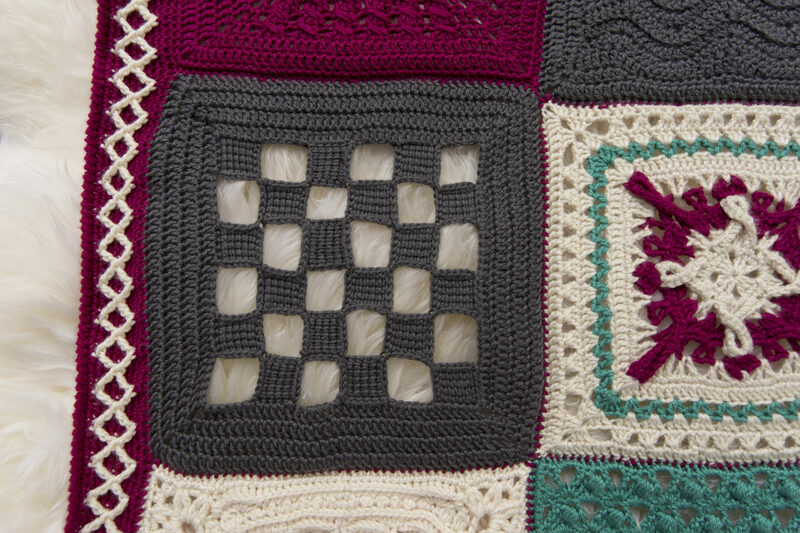 The Tunisian Checkerboard Square is part of the Creative Crossings blanket. This was a collaborative project between 15 designers, as a token of appreciation for Lorene Eppolite is Cre8tion Crochet. We were lucky enough to be a part of her beta group in Cre8tion Business Academy. 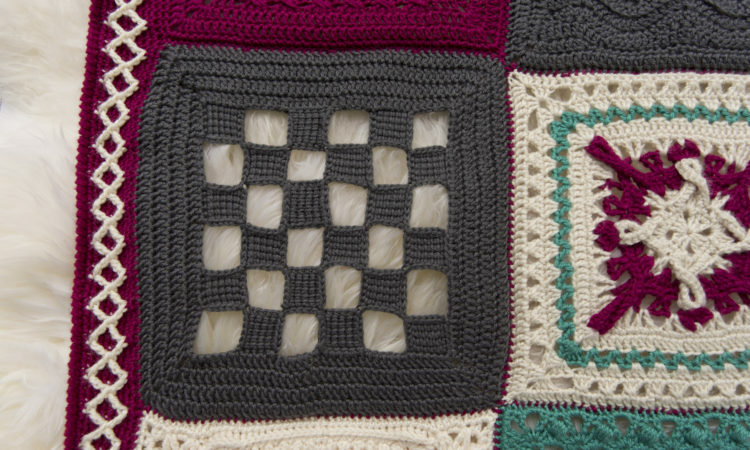 We worked together to create sqaures for the gorgeous blanket to match the Cre8tion Crochet theme using Red Heart Soft in Deep Sea, Berry, Off White and Charcoal. The Tunisian Checkerboard Square was made in charcoal, but would look lovely in any color. The Tunisian Checkerboard was inspired by tunisian entrelac, but rather than use two or more colors, I decided to use just one color that creates solid and open squares, like a checkerboard! I have always been fascinated and intimidated by tunisian crochet, so to design a small project with tunisian was a great introduction. And since it’s small squares, you don’t need a tunisian or afghan hook. All you need is a straight neck hook to make these little squares. Follow the diagram at the end of the pattern to know the direction that the squares will be made. They are in numerical order. Do not turn at the end of each row of the square. Block square to final measurements. Ret Pass: YO, pull through one loop, *YO, pull through two loops. Repeat from * until one loop remains. 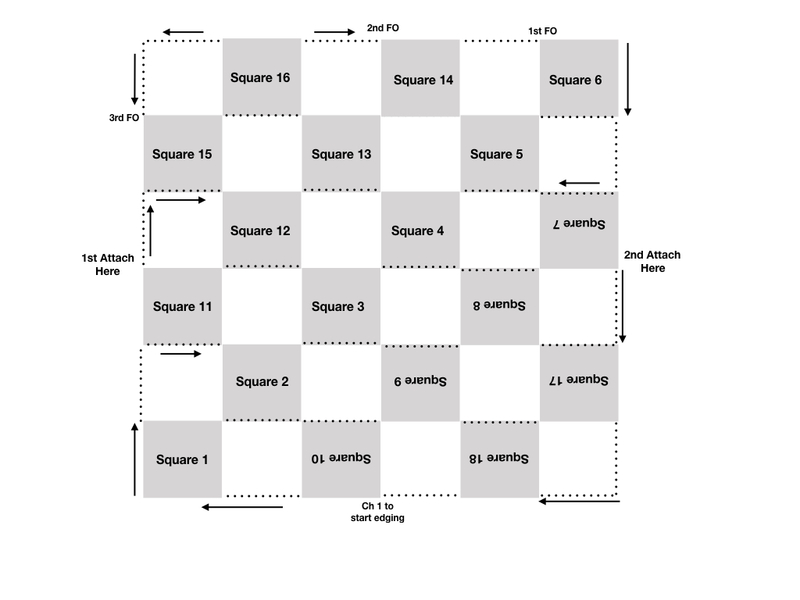 Working in the ch-7 (represented by the black dots in the diagram at the bottom of each square), make each square in the same manner as Square 1. Be sure to ch 7 after each Row 5 Ret. Rotate piece and attach yarn to top left corner of Square 17 (4th Attach Here), ch 10, slst to join to Square 18. Block your square to the final measurement of 12” x 12”, and enjoy! The arrows represent the direction of the chain groups and the direction that the piece will be rotated in order to continue the pattern. The upside down squares represent that the piece will be rotated in order to continue pattern. Edging rows are not represented in the diagram.